So, during the last months, I contacted many Hyundai dealers, the Hyundai headquarter, the Hyundai motorsports headquarter... and no one ever knew anything about it. Right now, it looks as if it is only available in South Korea. It is really expensive, but the XB model can be ordered at Gmarket.com. No one knows if the model will be ever available outside of South Korea... if you want to have on, Gmarket seems to be the only solution so far. I think that this is just a distributional issue... it seems to be an item which is distributed by Hyundai, not by RC stores. And Hyundai decided to offer it only within Korea. I tried to purchase one from Gmarket and almost 3 weeks after taking my payment they advise they are unable to ship internationally.....very frustrating as they should have made that call at the outset. Not sure how trustworthy the site is as a result. That's weird. Some days ago, a member of a big Tamiya Facebook group presented his kit, which was bough via Gmarket. My XB car also arrived some days ago, so there seems to be no general issue when buying via Gmarket. Distribution policy about the RC car item might be related to Tamiya Korea where has designed some Hyundai real cars into mini 4wd and RC car items including i20. There is their own official online store named Tamiya Mall, but the mall is only for domestic region. Recently, a Hyundai mini4wd item which has been sold in Korea was introduced at the hobby show in Japan. I hope i20 RC also would follow it sooner or later. Online shops in Korea aren't used to selling overseas because one of the main reasons looks language barrier. Also most shops there don't get Paypal payment unlike RC Mart in Hong Kong. Yes, somewhat not being opened much in the point. I’m currently trying to befriend various people in South Korea online to buy me one and ship it over, but no luck yet, they keep wanting me to turn my webcam on and do odd stuff with fruit... sigh! Apologies for lowering the tone, mods delete if need be. I recently purchased one from Gmarket using PayPal and intended to ship to Virginia in the U.S., but I also got the email today saying that they could not ship the kit version internationally. Before the email, everything went okay: shipping, U.S. address, PayPal, but I guess not somehow. I just got an email from them after the first saying it's been cancelled, this one asking for a bit extra for shipping, about $20USD, so I paid. My order for the kit no longer says cancelled, but just 'pending'. Thank you for shopping on Gmarket. fee is ￦21,530. Please make this payment as soon as possible to be shipped out. If you have any further inquiries, please contact to Customer Service Center. We will try our best to serve you in all ways possible. So have you ordered the body or the whole car? Sorry, the kit version: 93044. My Bodyshell only has now been shipped internationally, it already went through the GMarket domestic posting to their main warehouse (from the individual seller) and has now been sent out to the UK... I’d already paid the shipping fee and it looks like it didn’t need any further top ups so went straight out. Lets see how long it takes from South Korea to UK and if customs duty gets applied. Got an idea what part no the wheels are. I’ll be painting my fronts red I think.. assuming my body order goes through easily like yours did. 54738 maybe? Or 54340 as 26mm. 54738 are 24mm wheels aren’t they going to limit tyre choice? Otherwise they will look good... The Red fronts and black rear wheels looked ok too. i got the impression that the body was pulled from the XB? The body has a separate 5-digit item number, something none of the XB-bodies as a spare part ever had, so I'd say it's rather likely an unpainted and uncut regular bps. Why? They don’t call it an XB body anywhere? 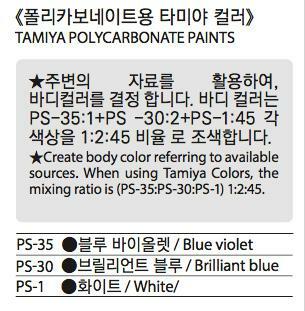 I'm not sure how you're supposed to paint it - the instructions specify a mix of PS colours. Decant and then airbrush? Perhaps there's specialty brick-and-mortars that will decant, blend, and re-can colors for you? I've heard there's shops that do this for "professional" graffiti artists... In Germany of all places.